On behalf of the team at Mercure Wagga, we look forward to welcoming you to our Hotel and creating a memorable stay. Style and sophistication has arrived with the opening of the newly refurbished Mercure Wagga Wagga. Centrally located and featuring 86 hotel rooms and self-contained apartments with a range of flexible bedding configurations, guests enjoy modern room and hotel facilities with easy access to the city's finest dining, tourist and business hotspots. 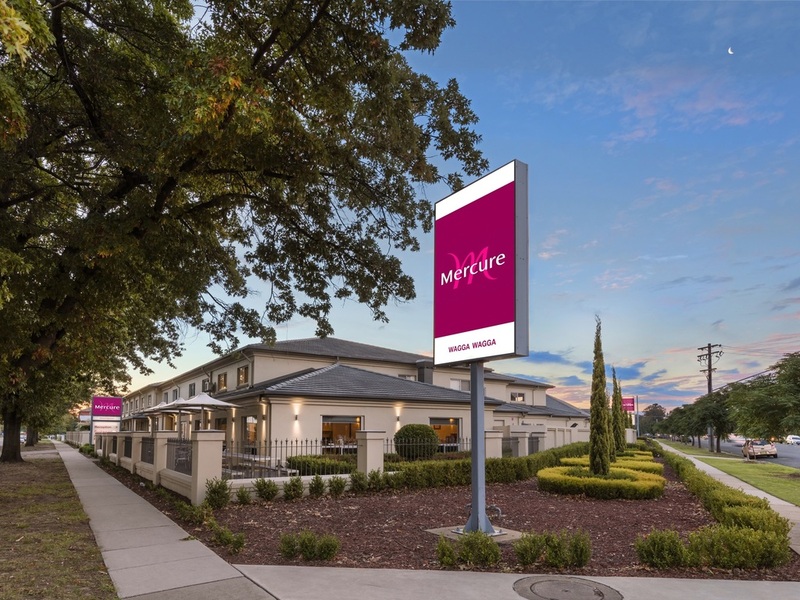 With comfortable bedding, large flatscreen TVs, free Foxtel and onsite parking, Mercure is the hotel that provides the best value in Wagga Wagga. Wagga Wagga, in the heart of the Riverina, straddles the mighty Murrumbidgee River and is NSW's largest inland city, featuring a wide range of tourist opportunities to take in Australia's natural beauty and agricultural as well as military history. Enjoy contemporary Australian cuisine in a relaxed informal atmosphere. Local produce is a feature in the menu which offers a wide range of dishes to suit all tastes and budgets. The bar is a great place for a round of drinks with friends before or after dinner. The staff in general were god the the chap at night needs to improve his customer skills. see above, all in all pretty good property looks very tired but the staff make up for it. We have stayed there a few times. The only mess up seems to always come from your central booking office. I have taken to phoning the property direct after I make a booking to see if it is okay. so far only booking has been correct and that was our last booking in Sydney. Really would prefer to be able to book with someone in Australia. The website is a waste of time. Usual nice and convenient stay. Spent a couple of nights at the Mercure because we were attending a family wedding nearby. I grew up in the area. Only a short stay on this occasion but everything met all our expectations. The room upgrade was a much appreciated surprise and all staff very friendly and attentive. The Room was very comfortable and the Restaurant first class. The Mercure Wagga Wagga is always our choice of accommodation when we are in Wagga Wagga. The staff are always helpful polite and courteous. The rooms are spacious, clean and comfortable. Not the greatest experience. Room layout was strange. Shower layout leaves entire floor soaked in water. Toilet paper comes from a dispenser... A DISPENSER! With 1 ply paper. Charging $200 a night for a basic room and it was such a cheap feel. Staff were friendly although wouldn’t stay here again. Renovated motel style accommodation with a hotel style rooms as well. Nice big room. Excellent bathroom with good water pressure. Nice small bar area. In a fairly good location 10min walk from main Street an pubs etc. As always service was great. Always a pleasant stay when in Wagga. Rooms are clean and the complimentary drinks are nice at the end of a long trip. Centrally located within easy walking distance to the main cbd. Everything was absolutely fine, the Restaurant food and service was also as expected. Only disappointment was the fact that the black lounges in the room and in the bar area certainly need to be preplaced or recovered as they look pretty tatty. Everything was fantastic, and in particular the reception staff were so lovely! They were so friendly and also very helpful when I need anything and also when my card for my room wasn't working. The staff were so accommodating and ended up moving me to another room. Thank you for a fantastic stay! !